What data rate can be set on RS-485 and CAN 2.0 interfaces? The maximum data rate between interface converter and digital modules via RS-485 and CAN 2.0 interfaces depends on cable line length, linear resistance of the used cable, and the number of installed digital modules. 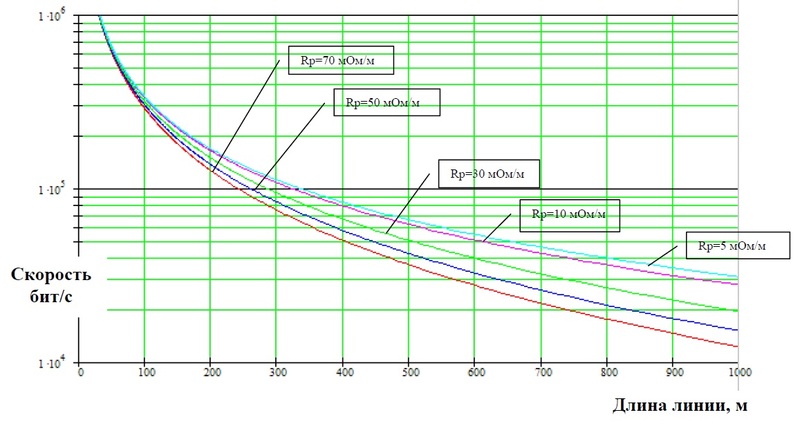 The graphs (on the figure) calculated for a measuring line with 32 digital modules (with 20 kOhm input resistance) show maximum data rates on RS-485 and CAN 2.0 interfaces for different linear resistances and cable lengths. To determine data rate of a device connected with the RS-485 interface, use device search software in the RS-485 measurement line. The software searches devices on the sensors measuring line with RS-485 digital output. As a wizard, use any USB-RS485 type device connected to PC and creating a virtual COM port on it. The software uses a user-defined COM port and searches through standard data rates, parity bit check and slave MODBUS device addresses, sends requests and waits for replies. After passing each cycle, the software displays the number of successful transmissions, i.e. requests with reply from the slave device.